Ok, folks, that's as far as I'm going and even then I'm feeling a bit more on the ridiculous side (as I clearly demonstrate to you that I cannot write odes of any sort!). However, I just want to say that I'm having a great deal of fun reading the Betsy-Tacy series. 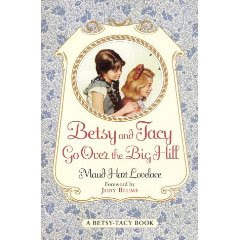 I just completed reading the book Betsy and Tacy Go Over the Big Hill . Because Sarah has already read it and written an excellent review of this particular title, I invite you to click over and read her review of this particular Betsy-Tacy adventure. The only thing I'm going to tell you is that in this book Betsy, Tacy and Tib each turn 10 years old. Ten to them is the epitome of perfection because it gives them each two numbers in their age which means, of course, that they are growing up! I remember when I turned 10. I was very impressed with myself and with the number. My mom allowed me to be excited about it and excited I was! TEN. That's a big benchmark to hit! The reason I love these little girls and their friendship is because the stories do not feel made up at all. They feel very real indeed. The girls do things that I did with my best friend, like pretending to be royalty and wishing kings and princes for ourselves. When I was 10(ish) my best friend and I would tie blankets around our waists and pretend that they were long trains from our beautiful princess gowns. Therefore Betsy, Tacy and Tib's fascination with royalty in this particular book struck a familiar nerve and I laughed and smiled to myself in great delight. Mostly, I remembered when it was ok to pretend. If I had a little girl I would want her to be as innocent as these girls were for as long as possible. What do I mean by that? I would want her imagination to be free to roam hills and dream big dreams without reality crashing in on her every ten seconds, informing her that hopes are meant to be dashed. I love that the parents in this book smile down at their chidlren's playtime, encouraging them to foster their imagination, pursue creativity and all the while you just know that the parents are looking out for them and truly care about their safety and successes. I would like to think that the values of the time period in which Betsy and Tacy lived are not dead. Rather, we just need to fan the flames of creative brilliance once again. Love these books. I'll be collecting them for our home bookshelves so that we can enjoy them for some time to come! I've never heard of these books! They sound great. I will have to look for my own copies to add to our library! A wonderful ode :) The Betsy Tacy books are such favourites of mine. I'm so excited because I have The Betsy-Tacy Companion: A Biography of Maud Hart Lovelace waiting for me at the library!! I read the review on Amazon and it looks like a lovely read. Love, love these books! They are m favorite books of all time.